Successfully Added HK Warehouse UMi Diamond Smartphone - 4G, Android 6.0, Octa Core CPU, 3GB RAM, OTG, 5 Inch HD Screen, Arc Glass (Gold) to your Shopping Cart. Featuring a custom made metal uni-body frame that manages to keep the phone light without sacrificing strength the UMi diamond is a joy to look at and its brushed metallic finish it feels and looks sublime. 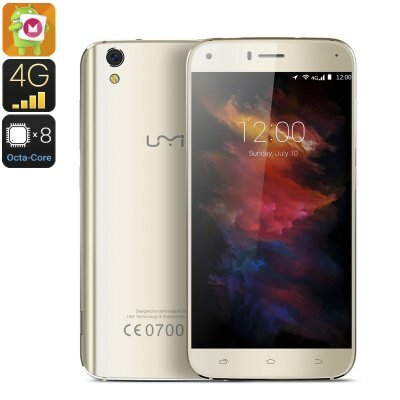 The new diamond in the UMi's crown this 5 inch smartphone has an HD resolution screen with a 2.5D glass. this brings further protection to the screen allowing it to better resist damage. The Phone is powered by an MTK6753 64Bit Octa Core CPU which runs alongside 3GB of RAM, with 16GB of internal storage and up to 128GB available via the micro SD card it has got sufficient power and storage for all your daily needs and will handle gaming, movies and multitasking with supreme proficiency. 4G connectivity on the phones two SIM slots allows for high-speed connections and the wide range of supported frequencies brings great global coverage and the flexibility to use multiple carriers at the same time for the best coverage wherever you may be. Running on the Android 6.0 Marshmallow operating system ensures the latest Google features are available on this phone for a better and more personalized user interface. The phone's rear camera has an 8MP sensor and the front uses a 2MP one for selifies and video calls. With a 2650mAh battery you'll be getting around 6 hours of talk time from every charge.